It’s a little embarrassing to admit that despite growing up around Providence, RI, I only recently had my first Venda Ravioli experience over the summer. After eating there, I’m more than disappointed in myself for not trying it sooner and sad that I went so many years without it! Almost everyone knows the name as I did, but it’s not nearly recommended enough in my circle of friends. Parking can sometimes be a pain, so try and go during the day, but don’t expect Venda Ravioli not to be packed because it usually is. 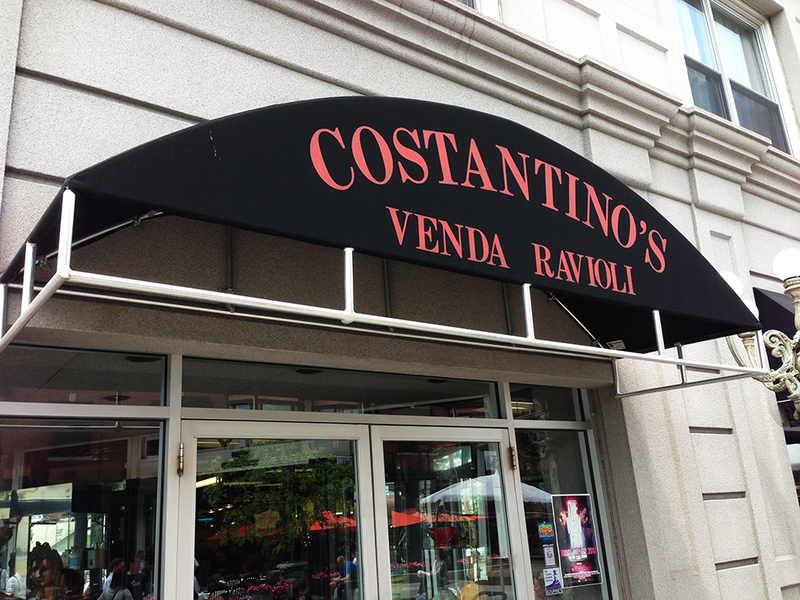 You can find Venda Ravioli on the infamous Atwells Ave. in Federal Hill. I say infamous because despite being largely considered Providence’s “Little Italy” area, there are a lot of extremely mediocre restaurants in the area (luckily Venda isn’t one of those mediocre places). 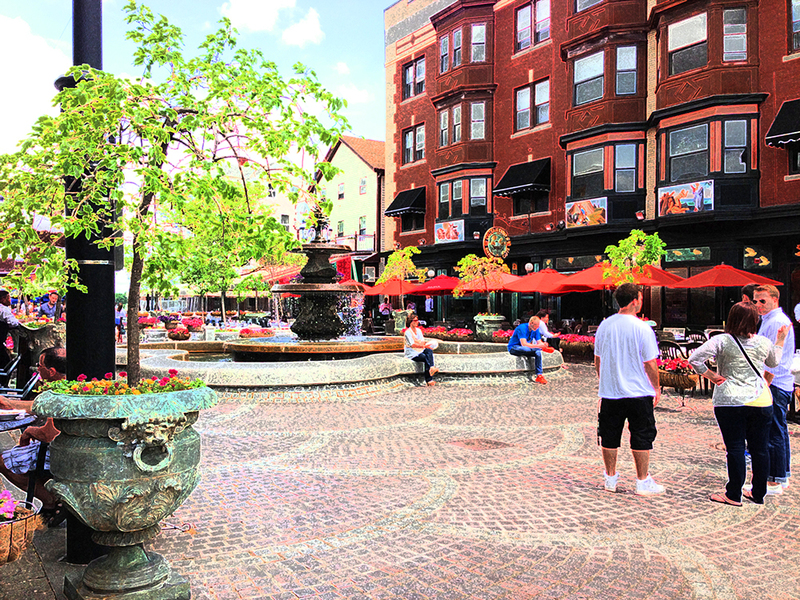 Nonetheless, the scenery is really nice with a lot of Italian notes as well as open areas in Depasquale Square. For example, just outside Venda Ravioli’s door is a fountain and courtyard where people can sit and eat or just walk around. Upon entering Venda, I experienced a little sensory overload. 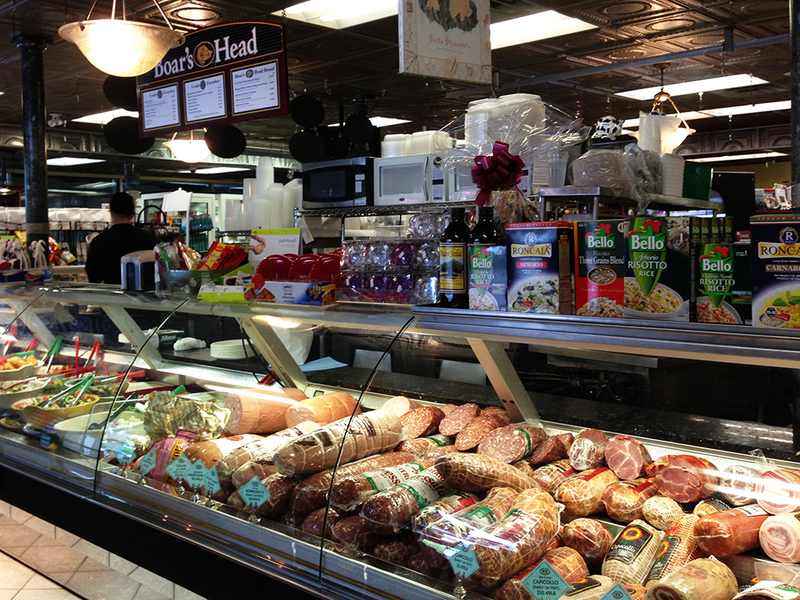 While Venda Ravioli is a restaurant, it is also a deli, and a market. 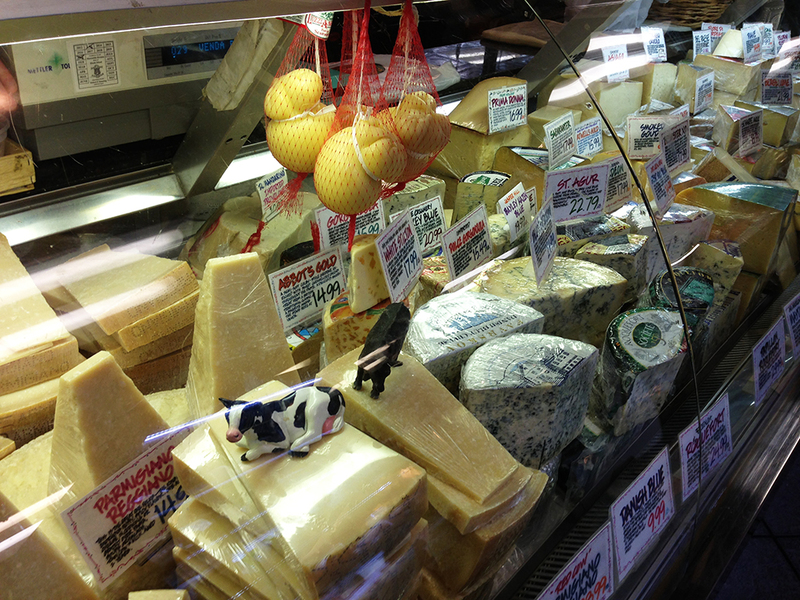 They have all kinds of authentic, homemade-style, treats such as cases full of imported cheeses. 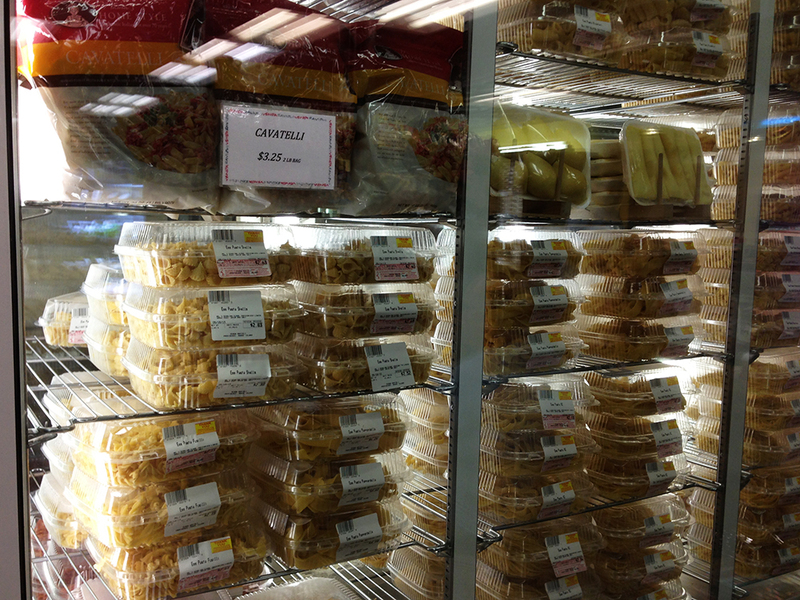 They also have freezers full of all kinds of formerly fresh pasta that people can purchase and which are ready for boiling at a moments notice. 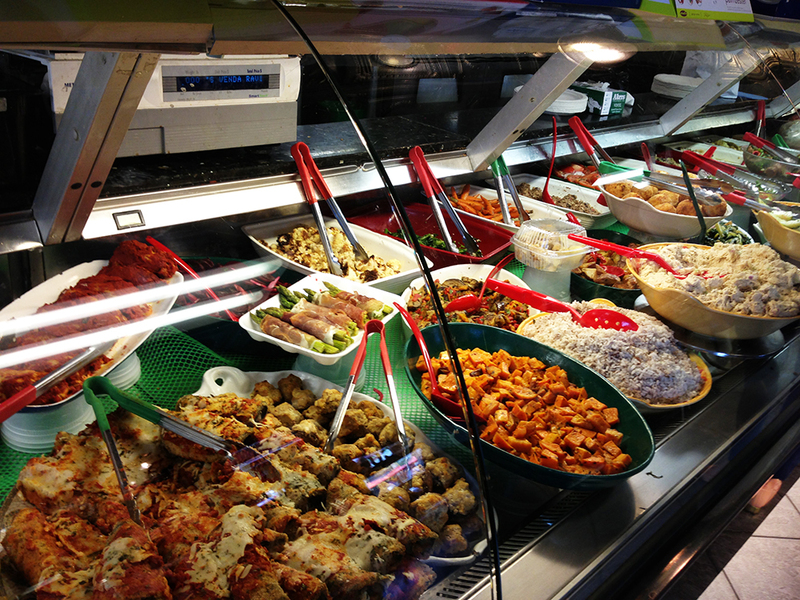 Not to mention that they also have a seemingly endless supply of antipastos, olives, and side dishes near the deli. 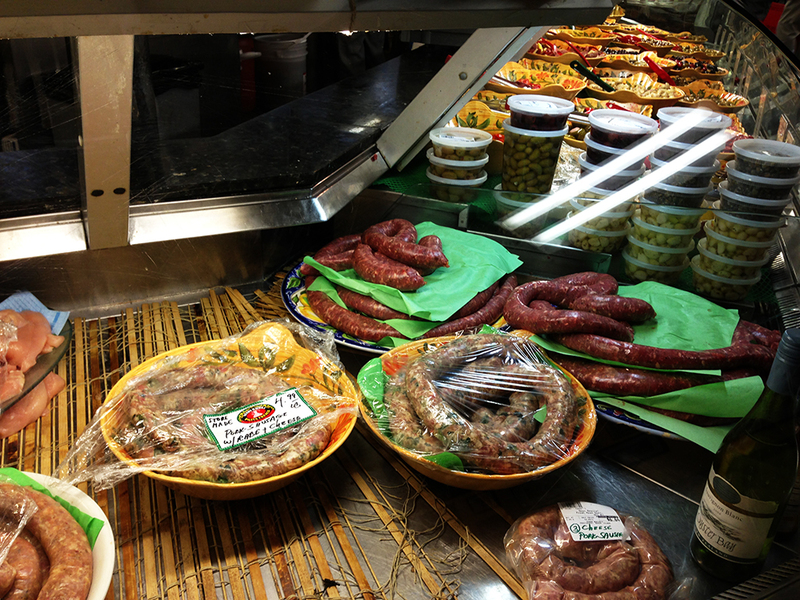 I didn’t purchase any, but I did note that they had what looked like numerous homemade sausages of the kind that aren’t already broken down into individual links. As I briefly mentioned, Venda has a deli with its own menu as well as a sit-down dining area with a different menu. On this occasion, I wanted to try the deli and to sample some of the incredible sides inside the glass cases surrounding the deli area. We first picked our sides, which were sicilian olives and prosciutto stuffed cherry peppers. The olives, as expected, were a little more toothsome (like that word? I learned it from watching Bizarre Foods with Andrew Zimmern!) than Spanish olives. They were pitted and covered in a generous dose of olive oil and oregano. 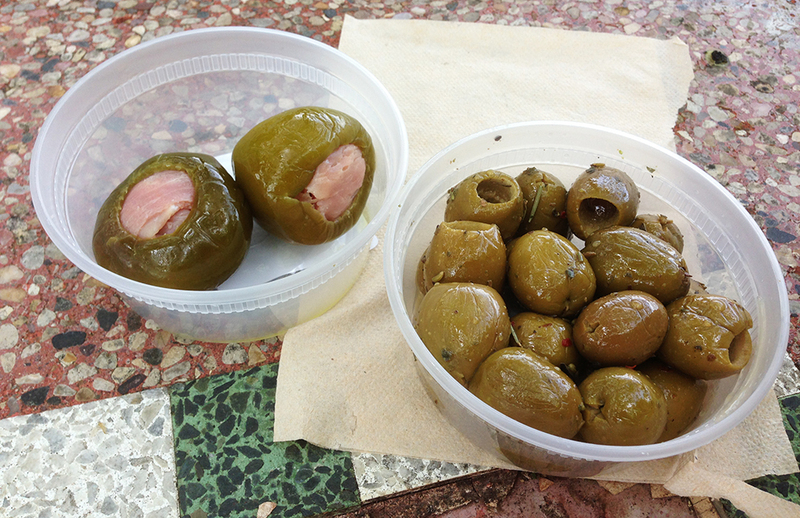 They tasted great and weren’t as sour as Kalamata or Spanish green olives. I would recommend giving them a try for a milder olive experience. The stuffed cherry peppers were absolutely incredible as well. The first surprise was that the prosciutto still had a lot of flavor despite sitting in the pickling oil and vinegar. The second surprise was how sharp and strong (in a good way) the provolone cheese encased in the prosciutto tasted. The pepper itself wasn’t too sour or spicy as often happens when they are prepared badly. With one incredible flavor embedded in another the stuffed cheery peppers were like those Russian Nesting dolls (Matryoshka dolls), except edible and delicious. 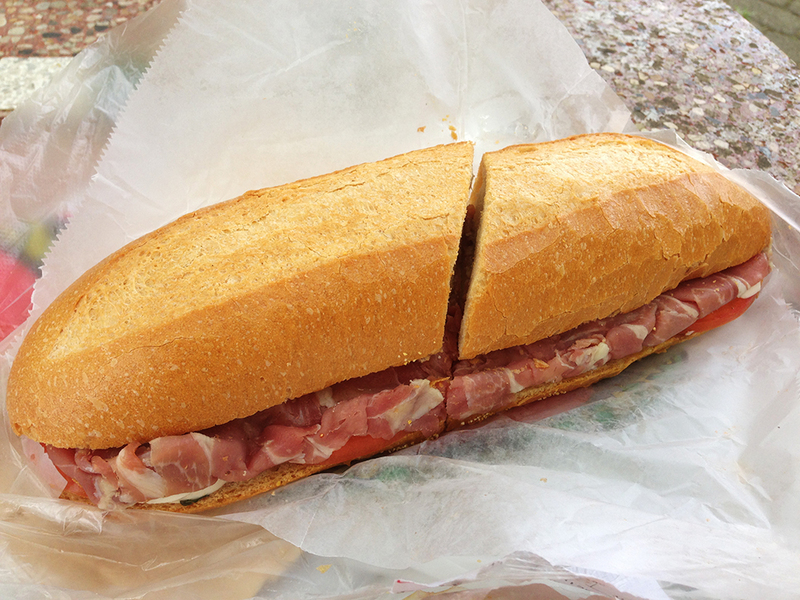 After picking our sides, we wanted to try two sandwiches from the deli. 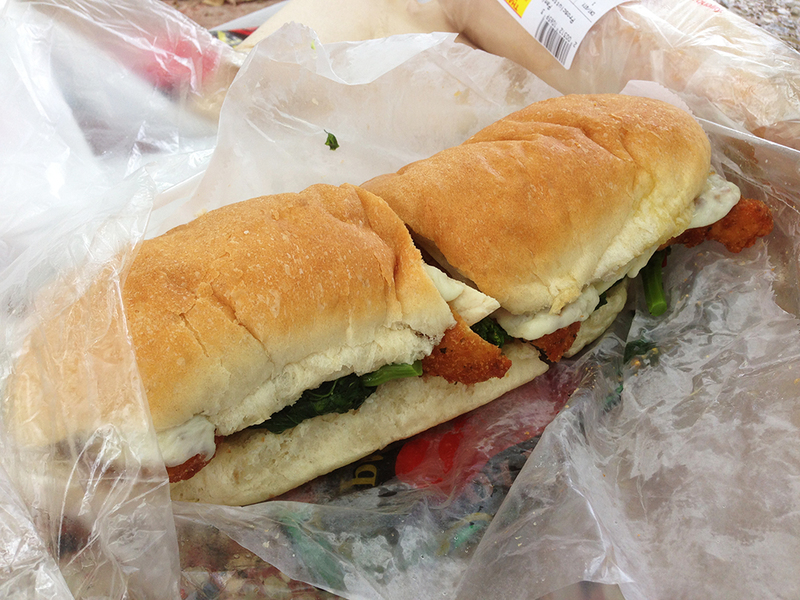 We first tried a breaded chicken cutlet sandwich with broccoli rabe and provolone. We had the option of choosing soft or hard sub bread and for this sandwich we chose soft. The employee behind the deli counter went to work warming up the ingredients and putting the sandwich together. When it came out, I could feel the warmth through the layers of wax paper. The sandwich had some really good flavors between the warm chicken and the sauteed rabe, but it felt like it was missing something to me. I’m not sure what it was, but it may have needed a bit more seasoning or something. Overall, the sandwich was good and light in flavor despite the heavy ingredients. If I ordered this sandwich again though, I would definitely get it on a hard/crispy sub roll instead of a soft one. The soft bread didn’t hold up as well against the warm ingredients. The other sandwich we tried is one of my favorite sandwiches when it comes to a perfect combination of ingredients. It’s the prosciutto, fresh mozzarella, tomato, and basil sandwich (check out my Caprese Salad Recipe Here). A restaurant or deli would have to really try to mess up these ingredients, so Venda already had that in the bag. Nonetheless, the decision to put this sandwich on their crispier hard sub roll was pure genius. The crusty bread contrasted really well with the salty prosciutto and the soft, mild mozzarella. The fresh tomatoes posed no threat to the structural integrity of the crispy bread and the fresh basil complemented the tomatoes perfectly. This is the sandwich to beat at Venda Ravioli. I would have been happy already if all I did was go to Venda Ravioli and see their incredible store area with so many amazing Italian options. It only added to the experience that the food matched the impressive variety offered in their store. Highly recommended as one of the few truly good places left to eat on Federal Hill in Providence! My favorite is the Italian Panini, nothing that you would expect when ordering a panini. First you got to order with everything, then wait to savor…the crusty fresh Italian bread and all the ingredients…huummmm, be prepared for the explosion of flavors and textures in your mouth. I come yo PROVIDENCE about once or twice a month, when that happens I make sure not to have lunch and always manage to stop by and get this baby. It is big and hearty enough that it cover my lunch and dinner. can u order things online to deliver???? ?